China’s campaign to expel migrant workers from Beijing is designed to wring more profit from urban land and reserve the city for elites. 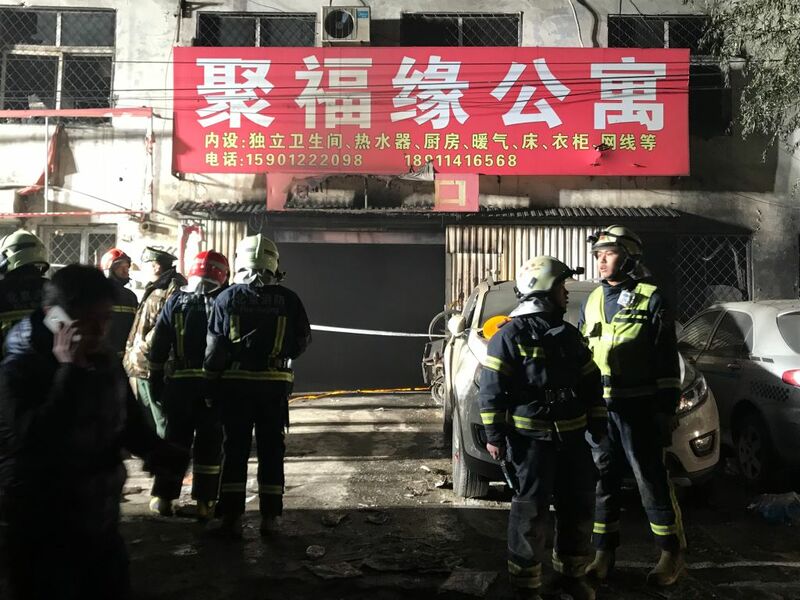 On November 18, a fire on the outskirts of Beijing killed nineteen people, including eight children. Skyrocketing rent in the urban core has pushed working-class people — especially migrant workers without local residency permits — into shoddily constructed, crowded, and poorly regulated housing, setting the stage for this all-too-predictable tragedy. Dangerous living conditions, exceedingly long commutes, and exposure to health risks are simply the price impoverished migrants have to pay in order to access the booming urban labor market. Following the fire, the Beijing city government — almost certainly in consultation with national leadership — snapped to attention. Within days, it launched a forty-day campaign to address building safety violations. But the real intention has quickly become evident: to rid the city of people deemed extraneous. These expulsions are consistent with China’s long-standing policies that dehumanize and exclude migrant workers. But purging Beijing of this population will also free up land for more profitable uses, giving the revenue-hungry city added motivation. As a result, the original tragedy has quickly transformed into a state-directed catastrophe on a much larger scale, as tens of thousands of people face eviction, dispossession, and homelessness in the fast-approaching winter. Images of demolished buildings and streams of weary people look more like a city under siege than a major metropolis — fitting, since the state has declared all-out war on its urban underclass. Many elements of this campaign seem unnecessarily cruel and have generated resistance not just among migrants but also among sympathetic intellectuals and other residents. Yet the government has shut down nonprofits and private citizens trying to provide housing and other forms of assistance to displaced people. The government’s rhetoric of removing “low-end populations” has also sparked widespread outrage. The state gave many people mere hours to clear out of their apartments; in some cases, it cut off electricity and water. It has even razed entire neighborhoods. The campaign’s scale and ferocity has been shocking, even to a citizenry relatively accustomed to an overbearing state apparatus. Indeed, the central government has been waiting some time for the right moment to strike. For many years, Beijing and other megacities have expressed their intentions to improve the “quality” of their urban populations. Though Beijing has consistently set (and then exceeded) population limits, something changed in 2014. That year, the central government released the National New Urbanization Plan (2014–2020), which established urbanization, rather than industrialization, as the engine for a more equitable and sustainable model of capitalist development. The plan calls on “extra-large” cities — those with an urban district population exceeding five million — to “strictly control” population growth. Wealthy cities like Beijing, Shanghai, Guangzhou, and Shenzhen would belong to the elites, while the low-end population would be relegated to low-end cities. To speed the program along, Beijing and other metropolises have been making life intolerable for working-class migrants: revoking access to education for their children, relocating labor-intensive sectors further and further from the urban core, and occasionally demolishing schools or settlements. This current round of expulsions is not a new approach to urbanization, but an expansion of an ongoing process. [China] has plans for production in factories, for producing cloth, tables and chairs, and steel, but there is no plan for producing humans. This is anarchism — no governing, no organization, and no rules. This government perhaps needs to have a special ministry — what about a ministry of birth control? Although China never realized Mao’s suggestion, it did of course develop the world’s most comprehensive and effective policy for regulating reproduction. And, in 1958, the central government introduced the hukou, or household registration system, which tied the provision of social services to specific places, making it very difficult — if not impossible — for citizens to relocate without official approval. These two technologies gave the state an unparalleled capacity to control the production and distribution of human beings. In the era of capitalist transition, prosperous cities have used these tools to filter their populations, aiming to admit just the right qualities and quantities of labor at just the right time — an approach I’ve termed “just-in-time urbanization.” Drawing in cheap labor has fueled high-speed capital accumulation, but urban elites face competing pressures to draw in and expel workers: they must ensure the availability of pliable laborers without sparking social chaos or spending too much on schools, health care, housing, and pensions. This tension explains, at least in part, why cities like Beijing have continually exceeded their self-imposed growth limits. This mass eviction campaign shows that the urban state is now willing to risk depriving capital of labor in order to realize their utopia of orderly and socially sterile metropolises stocked exclusively with the elite. It also indicates that the state is turning its back on employers that depend on cheap labor, siding instead with real estate interests eager to turn more profit than rent on cheap housing can provide. Since the campaign began, labor-intensive businesses have been scrambling to keep their workers in Beijing, with e-commerce giants Alibaba and JD.com making housing arrangements for their displaced couriers. Residents have complained that the street hawkers they depend on have disappeared, and workers who keep Beijing’s airport running have also faced eviction. Migrant laborers may be a despised underclass, but the city cannot function without them. These contradictory pressures will push the state into schizophrenic behavior, and the nation’s most vulnerable will pay for this instability. There is no silver lining to nineteen unnecessary deaths and tens of thousands of people rendered homeless. But one hopeful sign has been the various acts of support from urban residents. We should not overstate the implications and scope of this backing, and some efforts are undoubtedly paternalistic assistance rather than acts of solidarity. But as housing prices continue to climb, wages for most fail to keep up with the cost of living, and schools and the labor market remain intensely competitive, a segment of officially recognized urban residents might begin to see reflections of their own position in the precarious lives of migrant workers. After all, state protections from the market aren’t what they used to be, even for those with a highly coveted Beijing residency. As the government drags nonresident migrants out of their homes, the market is ensuring that millions more cannot participate in urban life — regardless of their residency status.